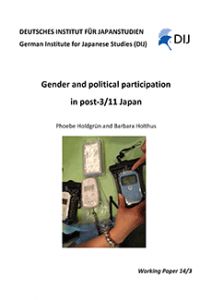 2014, Deutsches Institut für Japanstudien, Tokyo, 25 p.
In the aftermath of the triple disaster of March 11, 2011, concerned parents throughout Japan formed over 300 social movement organizations nationwide for the protection of children from radiation. Especially mothers have become active within that organizational network. For many of them, it is their first time to become politically active. Their activism runs counter to the public discourse, which more so than ever constructs and idealizes mothers as “silent protectors of the family”. Motherhood and political activism are opposing each other in these constructs, yet are intricately linked with each other as well. 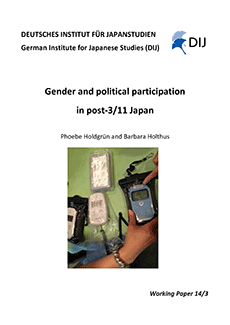 For two years, we conducted fieldwork among members of one Tokyo-based civil society organization, in order to analyze the strategies of participation of Japanese mothers and to examine how gender roles are played out between mothers and their “opponents”, all of them male representatives of “the state”. We evaluated the findings within the conceptual framework of social capital and advocacy. We find that the group members build up strong social capital but remain at a weak level of advocacy regarding their interaction with local authorities. This seemingly weak advocacy is however a desired state of movement action chosen by mothers who deliberately pursue a strategy of small but long-term approach.